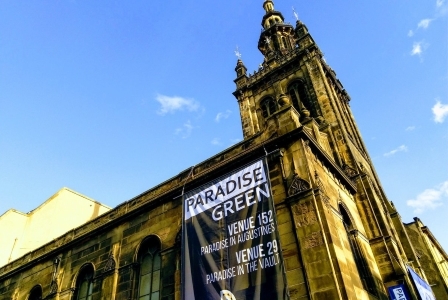 This page will help you get an idea of what it will cost to bring your show to Paradise Green. 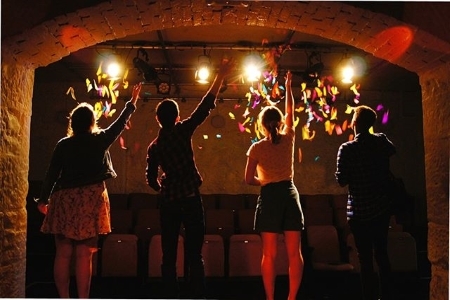 You can enter your choice of performance space, and the preferred times and weeks for your show, to get an estimate of what we will charge you; and you can explore different possibilities of these to see the effect on the cost. This may help you decide which are your preferred performance spaces and times, and which you would accept even if they are not your first choice. Our prices are all-inclusive, and we do not take a box office split. Your quote will be for the complete costs of hiring the venue for the full run of performances. All prices are quoted in pounds sterling, and are VAT exempt. Bookings can be taken for almost any length of slot over one hour, according to your needs, and fractions of an hour are charged pro-rata. The slot must include time for your get-in and get-out before and after each performance. The minimum get-in/get-out time is 20 minutes before and after your performance in the Sanctuary and Studio, 15 minutes in the Vault and the Annexe, and 10 minutes in the Snug. Shows with extensive technical set-up, substantial sets or lots of props must allow extra get-in and get-out time. Bookings may be for the full length of the festival, or any combination of full weeks. Please note that we will not necessarily be able to fit your show in at precisely the time you have asked for, and so the price may be different: if we make you an offer, we will make clear the price we will actually charge (or the most we will charge, if we make an offer with some variability in time). Performance Start Time 09 10 11 12 13 14 15 16 17 18 19 20 21 22 23 00 : 00 05 10 15 20 25 30 35 40 45 50 55 Please select your preferred performance start time. Please note that your slot will start earlier than this to allow time to set up for your performance. Your slot-length (performance duration plus get-in and get-out time) must be at least 60 minutes. 10 15 20 25 30 35 40 45 50 55 60 minutes The Sanctuary has a minimum get-in time of 20 minutes. If you feel your show will require more set up time than this you should specify a larger amount of get-in time. 10 15 20 25 30 35 40 45 50 55 60 minutes The Sanctuary has a minimum get-out time of 20 minutes. If you feel your show will require more take down time than this you should specify a larger amount of get-out time. You need to select the week(s) in wish you want to perform. You can only stage a preview performance if you are also performing in week 1. Add a preview performance - Friday 2nd August? (Week 1 shows only) Please select the weeks in which you wish to perform. We are unable to offer a reduction in price for companies performing for part-weeks. If you are performing in week 1 you may be able to stage a preview performance on Friday 5th August. Previews are limited availability and will not normally be at the same time as you regular performance slot. Your results will be displayed once you select your performance weeks. You will be performing your show in The Sanctuary. You will be performing your show during week 1. You will be staging a preview performance on the Friday before Week 1 begins. Your performance will begin at 00:00 on each performance day. Your performance will end at 00:00 on each performance day. You will have a get-in period of 15 minutes immediately prior to each performance. You will have a get-out period of 15 minutes immediately following each performance. Multi-Week Discount: -£0.00 (0% discount for performing for 1 week). This all-inclusive fee covers hire of the space, standard technical equipment, box office, front of house staff, ticket printing, entry in our brochure, press & marketing support, office facilities and free Wi-Fi at our venues. We do not charge a box-office split. Where there are extra charges, these are always for something over and above the standard package (for example if you wanted additional lighting equipment that is not part of our standard specification), and most of our groups pay no more than the standard charges listed. Any extra costs will be clearly identified and discussed with you beforehand. You do not have to pay the full fee immediately. A deposit of £100 is required when you sign a contract with us, with the remainder of the fee payable in four equal instalments before the Fringe. Nothing on this page will form any part of a contract between you and Paradise Green. Sound good? Applications are open now, and slots fill quickly, so please apply soon.